Here it is, here it is, here it is!! I am so excited to introduce you to my newest baby: my first e-book! Please take a look at it! Download your own copy or read it online, and then let me know what you think. Should I continue and write more chapters? I've got so many ideas floating around for more...more dimensional beading, more work with unusual materials, more altered surface fun...in short, lots more stories to share! There will be a link over in The Basics section of the sidebar, and at least for awhile, there will be a sticky at the top of the blog. I hope I don't make you totally sick of it before I even get started! Hi Cyndi, Oh my goodness thank you so much for this wonderful e-book! I just started bead embroidery and I'm so excited to look through your book! I've already skimmed through it and I have to tell you, more...write more please! It's fantastic and very easy to understand. I love your photo's, they're great and your project at the end is incredible and again very easy to understand. This will be so helpful to me and I'm sure to many other beaders! This is very generous of you to give this valuable e-book filled with information for free! Thank you so much. I hope that you have a lovely day. Best of wishes to you on many new books! Wow, Bobbi...I don't know what to say! Thanks so much for your encouragement :-) As soon as my head stops spinning, I'll be thinking about the next one. Perhaps altered surfaces...? THANK YOU! I have just started reading and I am learning alot already! Again, thank you! Wow! You did a great job on this book! I tend to do diagrams rather than photos in my instructions; I've seen extensive discussions in forums on whether one is better than the other (with no concrete conclusion). Your photos are great! Genevieve, I debated back and forth about photos and illustrations, but I decided that even though illustrations can be clearer, your own work NEVER really looks like that :-) I'm so glad you find the photos to be clear. Beth, I'm delighted that you are going to find it useful. If you make a beaded cover, I really want to see it!! Cyndi, what a fantastic ebook. I'm sure you put hours and hours of time and care into its creation. The SunShower Necklace project is a really cool piece, and you make it look so do-able. Also the gallery pieces at the end are absolutely inspiring. 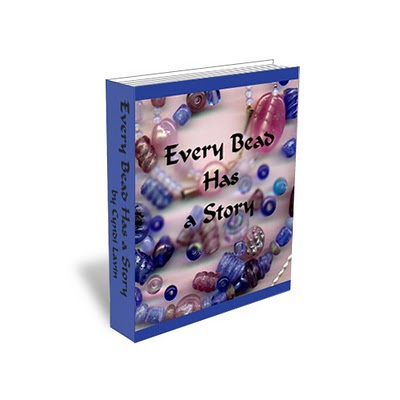 I think your lovely new ebook is better and more helpful than many published jewelry making books I've seen. May I recommend your ebook to my readers? Rena, you can say that you don't have talent for stitching, but I find it hard to believe that there is *anything* that you couldn't do if you decided to! I am honored that you read through it, and would be thrilled to have you recommend it to your readers. Thank you so very much. Cyndi--Thanks so much for your generosity in sharing your knowledge through this e-book. It is so full of excellent pictures and I can hardly wait to give this a try. Thanks again! CJ And, for sure, KEEP WRITING, please!! I'm not a beader, I'm a wire wrapper but I have to say you did a wonderful job on this. So many of tutorial or instruction books don't go into enough detail and you have given such great detail and some of the very best pictures I've seen in a long time. Your photos are very clear and explain each step clearly and I love the finished pieces at the end of the chapter.